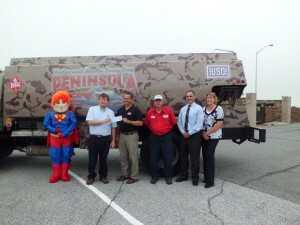 We have wrapped one of our fuel oil delivery trucks with the colors and logo of the USO! In addition, we are donating 1 cent for every gallon of oil delivered off the truck. 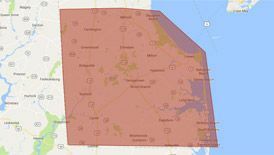 The USO of Delaware is well known across the Delmarva peninsula, and wrapping our vehicle gives us a chance to show our support with every delivery we make. Currently, the truck can be seen making deliveries across the Delmarva, as well as at parades and other USO functions. We walked in the Walk for Autism! Walk for Autism was held April 5th at Cape Henlopen State Park in Lewes . 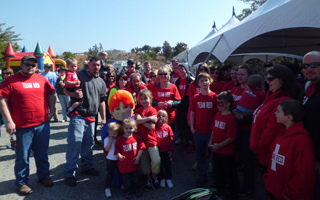 Peninsula employees with their families all created “TEAM RED” and walked together to help support Autism. Autism Delaware’s mission is to help people and families affected by autism. We were at the Lewes Polar Bear Plunge! See that snow on the ground? Yes, it was that cold, but many of our team members and their families came together to brave the icy depths and support the community. 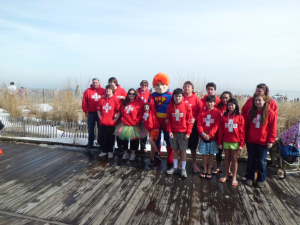 The Lewes Polar Bear Plunge to Benefit Special Olympics was held on Feb 2, 2014 in Rehoboth Beach. 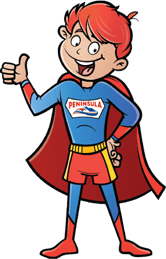 Peninsula was also the sponsor for the Chili Cook-off held on Feb 1st in Rehoboth as part of the weekend activities. Peninsula employees and family members joined Team Red to take the Plunge in 34 degree water. In total, 3,252 intrepid souls (or bears, as they’re called) made the plunge, raising a total of more than $725,000. Special shout out to Team Red: John Willey, Katlyn Calvert, Angela Ross, Krissy McCluskey, Jason Meredith, Tammy Faulkner, and Lisa West, who got wet and all together raised more than $4,400. Way to go, guys! The mission of Special Olympics Delaware is to provide year-round sports training and athletic competition in a variety of Olympic-type sports for 3,500 children and adults with intellectual disabilities, giving them continuing opportunities.